Mention in this document of commercial goods or services does not constitute an endorsement by the Alaska Department of Fish and Game. These videos, produced by Wayne Hall for the Alaska Department of Fish and Game, will demonstrate setting up an electric fence, including how they work and the components you will need for both backcountry and more permanent installations. All fences discussed on these pages are variations on the same theme-enclosures of wires, carrying a high voltage, low amperage charge, delivered in short pulses. They are designed to cause pain or fear in an animal, but not to cause injury. 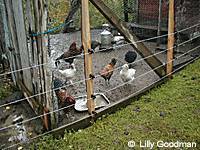 Electric fences have been used for many years on farms and ranches to contain livestock. What works to keep cattle and horse in, also works to keep bears out! Electric fences have three main parts. When used properly all three components create an open circuit, which closes when touched by a bear. This is similar to a lighting circuit in your home: the circuit remains open until you turn on the switch, which closes the circuit, and the light bulb comes on. An electrical device called a charger or energizer pushes and regulates power through the wires of the fence. Chargers that plug into household current (110 Volts Alternating Current--AC) also convert this current to voltage in direct current (DC). These devices, weighing only a pound or two, have been used for many years on farms and ranches to contain livestock. What works to keep cattle and horse in, also works to keep bears out! The wires of the fence carry the electrical charge. This is the "hot" part of system. When wires are touched, the bear is shocked. These wires are nothing more than uninsulated electrical wires set on posts to exclude a bear from a possible food source. The grounding rod is usually a 4 ft. by 5/8th in. rod of metal driven into the ground. The rod attracts the electrical current after it passes through the bear. The power is then returned to the energizer through a wire between the energizer and the grounding rod. In order to be effective as a deterrent an electric fence must be properly grounded. Please note that if you want to install a fence in a particularly dry area your fence vendor may recommend a fence wiring system that uses alternating positive and negative (ground) wires. When fences are constructed in this fashion, the bear touches both a positive and a negative wire at the same time and causes the electrical current to "short circuit" through the bear without having to pass through the ground. A system of this type uses the same materials as any system but requires at least 4 and preferably 8 strands of fencing wire. Many of the vendors in the Resources section have diagrams of how to construct electric fences for different applications. Low impedance chargers are recommended for all electrical fencing installations where the intent is to deter bears. These chargers are specifically designed to overcome loads-such as grass or branches that may inadvertently come in contact with and draw current from the fence. When selecting a charger specify a "low impedance" model. Fence chargers should deliver between 5,000 and 7,000 volts. While the exact amount of power needed to deter bears has not been scientifically determined, it is the best estimate of wildlife professionals that these numbers are sufficient. Joule ratings between 0.25 and 0.70 have proven effective for deterring bears. Electrical engineers determine power amounts in a measurement known as joules. Different energizers produce different joule ratings. It is suggested that when purchasing an energizer for a portable fence that it have a joule rating of between 0.25 and 0.70. Exactly what you need depends on the length of your fence, the number of wires used, and the severity of conditions. Be sure to describe your needs to your fence vendor who will help you with your design. Vendors are listed in the Resources section. Your fence location will help determine the best power source for you. The best choice for a given situation is dependent on such factors as where you will place your fence, battery charging facilities, and weight. It is easiest if you can plug into an outlet that connects to a village, town or suburban power supply. Chargers may be plugged into 110 volt AC (household) current. Away from power supplies, 12 or 6-volt DC batteries are an excellent choice. These "wet cell" batteries can be charged with boat and car engines, portable generators, or solar panels. 9-volt dry cell batteries are an excellent choice for remote situations and for people who choose not to purchase a solar panel charger. They are lightweight, long lasting, and relatively cheap. They can be purchased with 150 amp hour ratings. Stranded polywire consisting of at least six strands of stainless steel wire woven into a thin polyethylene rope is recommended. It has no "memory", is lightweight and easy to roll and unroll. The top strand of a polywire fence should be 1/2 inch polytape wire. If desired, polytape wire can be used for all the strands. Polytape wire has the advantage of being highly visible to both people and bears. However, a fence entirely of polytape needs to be firmly anchored in windy areas, and will attract frost and ice during freezing conditions. Lightweight aircraft cable has also been used in portable fences that can then be rolled up and carried around as a unit. This type of conductor does not degrade in sunlight or crack in cold temperatures, and has no "memory." We recommend a minimum of 3 strands of wire for portable fences, with the lowest wire at 10-12 inches and the upper wire at about 40 inches above the soil. Electro-plastic netting has effectively deterred bears at fish weirs and hunting camps on Kodiak Island. It's cheap, lightweight and easy to set up. You will also need short lengths of 12 to 14-gauge copper electrical wire to connect the energizer and the fence, and the grounding rod and the fence. For portable fences some people prefer alligator clips as connectors to the energizer. A standard commercial ground rod clamp is often used to connect the grounding rod to the fence. Dry soils are less conductive to the flow of electric current. Therefore you may need larger and/or multiple grounding rods if your soil is very well draining. Your fence vendor can help you to choose how many rods you will need and the most appropriate size and material, for the type of soil around your fence. A single 4 ft. by 5/8 in. copper rod driven 2 or 3 feet into the ground is adequate in most soils. An electric fence voltage tester will help you determine if your ground is adequate. Non-conductive plastic posts are a good choice for portable fences. Fence posts may be made of any material but wires must be insulated from touching the posts so that the electricity is not carried into the ground by the post. Many different commercial insulators are available and your vendor may have suggestions. Fence posts may be optional in brushy or forested areas. Some people have had good success with suspending fence wires with "zip strips" (plastic wire holders) from convenient branches. Essentially a gate is a place where a person can interrupt the fence circuit and make a place so they can pass through without disrupting the wires. Gates generally need an extra post or two. The gate needs to be made of wire and insulated, and hooked up to the other wires so it is "hot." You may want to get insulated gate handles. It is important that your fence have 5,000 to 7,000 volts at all points along the wires. For this reason we suggest you purchase a voltage meter specifically designed to test electric fences. Such units should also indicate that your fence is properly grounded. These meters can be purchased from one of the vendors listed. If you are planning a permanent electric fence for your lodge, camp, or home you may want to contact your local Alaska Department of Fish and Game for information about bears and fencing in your area. Permanent electric fences for solid waste sites and landfills have special considerations. Individuals or communities wishing to construct bear proof fences around these facilities to contact their local ADF&G management biologist. The Alaska Department of Fish and Game follows the energy requirements used by the U.S.D.A. Forest Service for electric fences in National Forests in the Western United States. The requirements are a minimum of 6,000 volts output at every point in the wire, 0.7 joules of energy available at the energizer, and a minimum of 40 shocks per minute. Your fence location will help determine the best power source for you. The best choice for a given situation is dependent on such factors as where you will place your fence and battery charging facilities. Solar battery chargers, come of which are integral components of energizers, are effective for fence systems that are off the power grid. Galvanized, smooth steel, or aluminum wire work well for large enclosures. Stranded stainless steel polywire and polytape are good choices for smaller sites. A minimum of four, and preferably eight strands of wire is recommended. The distance between wires should be six to ten inches. Dry soils are less conducive to the flow of electric current. Therefore you may need larger and/or multiple grounding rods if your soil is very well draining. Your fence vendor can help you to choose how many rods you will need and the most appropriate size and material, for the type of soil around your fence. A single 4 ft. by 5/8 in. copper rod driven 2 or 3 feet into the ground is adequate in most soils. An electric fence voltage meter will help you determine if your ground is adequate. Many options are available. The only rule to follow is to use non-conductive plastic or fiberglass posts or make certain the wires are properly insulated from the posts using the many commercial insulators that are available. A permanent fence wire is usually stretched tightly between posts and may require sturdy bracing, insulators, and gates. Contact your fence vendor for recommendations. Essentially a gate is a place where a person can interrupt the fence circuit and make a place so they can pass through without disrupting the wires. Gates can be anything from a steel commercial unit big enough to drive a truck through, to insulated handles attached to each fence wire. Gates generally need an extra post or two. The gate needs to be made of wire and insulated, and hooked up to the other wires so it is "hot." You may want to get insulated gate handles. Electric fences are unlikely to harm people, pets or bears because the current or amperage is very low and is not likely to cause injury. However the voltage is very high, for this reason energizers send power through the fence wires in pulses, about once every second. Because the current isn't continuous, the animal or human that comes in contact with the wire has a chance to break free of the fence-feeling only a quick nasty jolt. To be certain you are purchasing a charger that will not harm people, bears, or pets look for a UL-approved label that meets federal safety standards. Avoid "weed burner" chargers. They have longer electrical pulses than the low impedance models, being designed to burn off vegetation that comes in contact with the fence. These units present a fire danger. Place appropriate warning signs on the fence. Use highly visible polytape if you expect visitors to your fence site. Caution children about touching the fence, using the gate, and operation of the energizer. Do not set fences up in streams, lakes, or standing water. Water conducts electricity. Animals or humans that stand in water and touch the fence could receive multiple shocks that may cause injury. Consider using electro plastic wire mesh when possible, or when you think there is a possibility young children may play in the vicinity of the fence. Wire mesh is highly visible and it discourages children and small animals from entering between strands of wire. Contact a reputable vendor for electric fences. The Resources section on this website offers some names and addresses. The Resources section also contains diagrams that will be helpful in setting up your fence. Your vendor should ask you to describe the type of use you envision. You'll need to tell them that you're using the fence as a bear deterrent, whether the fence needs to be permanent or portable, how large an area you want to enclose, what type of soil underlies the site (rocky, sandy, dry or wet), and how much human traffic you expect. Plan the complete layout of the fence. Determine the total length of the fence. Determine how many gates and if the fence will run over or under roads or other such areas. Be sure to include enough posts so that your fence wire doesn't sag and allow animals to cross. Most people find a distance of 7 to 10 feet between posts to be adequate. Gates and corner braces generally need a few extra posts. With your vendor, select your materials. You'll need an energizer (charger), grounding rod, posts, and wires. You'll need insulators and insulated gate handles in most cases. You may want stronger posts at the corners of your layout, especially if you are planning a permanent fence with taut wires. For some dry soil locations your vendor may recommend a system that has alternating positive and negative wires. Follow directions to set up your energizer. Energizers come with directions and in every case we've seen terminals to the fence wire and power source were clearly marked. Make certain your connections are secure. A short piece of wire is needed between the energizer and fence. For permanent installations standard wire connectors may be used. For portable units some people prefer alligator clips. Another wire is needed between the ground rod and fence. A standard commercial grounding rod clamp works well here. Connecting wires can be the same type as the wire you are using for your fence, or you may choose to use either 12 or 14-gauge electrical wire. Make sure you install the charger inside the fence so the bear can't destroy it. Place the grounding rod as close to the energizer as possible. This makes for shorter runs of wire between the fence, energizer, and grounding rod. If possible, drive the ground rod as deep as possible. It may be necessary to drive the ground rod into earth at an angle instead of straight down. Make sure you have an additional grounding rod for each 1000 ft of fence-you can't have too many grounding rods! Install your posts, wires and gates. Make certain your posts and wires are clear of branches or other vegetation. While most low impendence chargers can handle a minimum of interference, less vegetation-particularly wet vegetation-means a more effective fence. Install all of the accessories items according to the installation guide or individual installations supplied with the product. After the fence is installed, check the operation. Check all connections for tightness and make sure the fence wires are properly installed within the insulators. If an electric fence gate is used then make sure that it doesn't interfere with the circuit of electricity. Activate the energizer and check the fence system installation for correct operation. Use your voltage meter/fence meter to check your fence for both proper grounding and for adequate voltage at different places on the fence. Your meter is also handy for tracing fence line shorts and faults. Electric fences should be left on whenever possible. It is very easy to shut off the power when inside the fenced enclosure, however, unless you are absolutely certain there are no bears anywhere near, it is advised to always leave the fence ON. If a bear visits your property while the fence is turned OFF, the bear will learn that the fence is not always something to be feared. Test the current on a regular basis! Drought or other factors may reduce soil moisture, decreasing its grounding efficiency. Batteries must be charged adequately to provide needed current. Remove grass and branches or blowing trash that may drain the current. 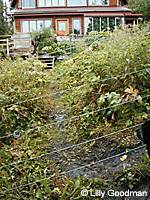 It is very important that the fence doesn't "ground out" due to excessive vegetation or trash on the fence wires. Sells a complete line of electric fence products. Customizes for each application. Rents lightweight electric shock bear fences. Designs, installs and sells electric fences that have proven effective in deterring bears. Specializes in safe, effective, and humane solutions for dealing with wildlife problems. Sells a complete line of electric fence supplies. Full line of fencing material, including 9-volt dry cells and electro-plastic netting. Offers on-line advice for predator fencing. Protecting Your Camp From Bears: Electric Fencing (PDF 122 kB), by Tom Smith, Ph.D., Senior Research Wildlife Ecologist for the U.S. Geological Survey in Anchorage, gives information on portable electric fences for use in the backcountry. The Alaska Department of Fish and Game recommends you become familiar with the energy requirements utilized by the United States Forest Service in their "Recreation Tech Tips" bulletin, Electric Fence Systems: Requirements for Meeting the NCDE (Northern Continental Divide Grizzly Bear Ecosystem). Several of the vendors in the Vendors section have websites that offer advice. 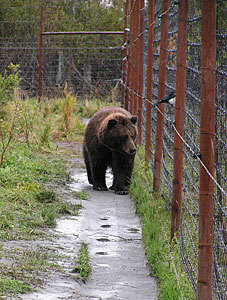 One in particular, http://www.margosupplies.com, has information about to electric fencing for bears. Three other sites, http://www.gallagherusa.com, http://www.fishock.com, and http://www.premier1supplies.com offer "how to" installation information.